Madison Plan submitted, followed by $50K award! Last February, the City of Madison was one of seven cities awarded a grant to develop a plan to connect children to nature. A community-engaged planning process then ensued, identifying ideas and priorities for the plan. As a result, Madison and six other cities (Austin, Providence, San Francisco, St. Paul, Louisville, and Grand Rapids) will each receive a $50,000 grant to implement year-one activities. Next steps include hiring a coordinator for implementation, setting u p our process for our initial focus on boosting access to nature, and working with partners to move toward building on existing efforts. Stay tuned for more details! Madison WI – February 10, 2016 – The City of Madison, along with six other U.S. cities, was selected to participate in a “groundbreaking” initiative, Cities Connect Children to Nature. 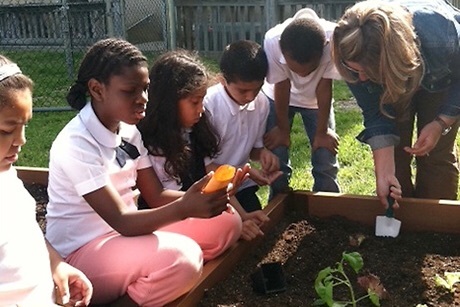 Sponsored by the National League of Cities Institute for Youth, Education and Families (IYEF) and the Children & Nature Network, the initiative seeks to give every child the chance to meaningfully connect to nature. Muir Elementary’s hard-working students got a boost from volunteers at CUNA Mutual during their 2013 garden build. The initiative was supported by the Madison Community Foundation Madison Metropolitan School District. 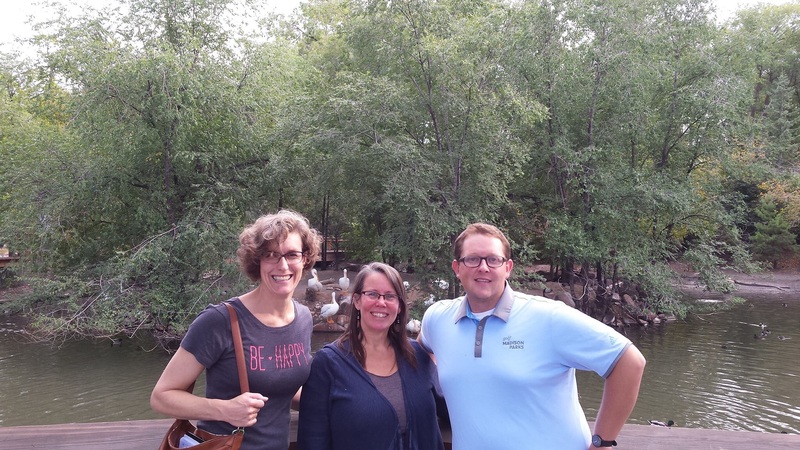 As a partnership between Public Health Madison and Dane County, City of Madison Parks and multiple community partners, the initiative recognizes a growing body of scientific research that points toward the powerful benefits that even small amounts of time spent in natural settings can offer. “It’s a great opportunity,” says Madison Alder Rebecca Kemble. “The additional resources will add a tremendous amount of value and national collaboration to our efforts to ensure that every child in Madison can connect to restorative, natural places and activities. Because of our rich City Parks system, many of these places are right nearby.” Other cities selected include Austin, TX; Providence, RI; San Francisco, CA; St. Paul, MN; Louisville, KY; and Grand Rapids, MI. “Nature captures children’s curiosity,” says Mary Michaud, Policy Director for Public Health Madison and Dane County. “Active play in nature helps kids restore their ability to focus, not to mention sleep. Nature play also teaches children how to negotiate all kinds of risk in very safe ways.” Recent research also suggests communities reporting more nature contact also report more social connectedness and less violence. The planning grant will facilitate a focus on increasing equitable access to nature and engaging youth leaders, emphasizing work with organizations serving youth and families of color. Partners will build a plan to ensure all youth have access to time in nature, developing important skills for leadership and civic action along the way. Phases of the 7-month process include 1) Taking stock, 2) Engaging for action, and 3) Identifying a sustainable city-wide model to support the work. This summer, youth leaders will complete assessments of neighborhood environments and out-of-school time opportunities, actively shaping the results of the City Plan. 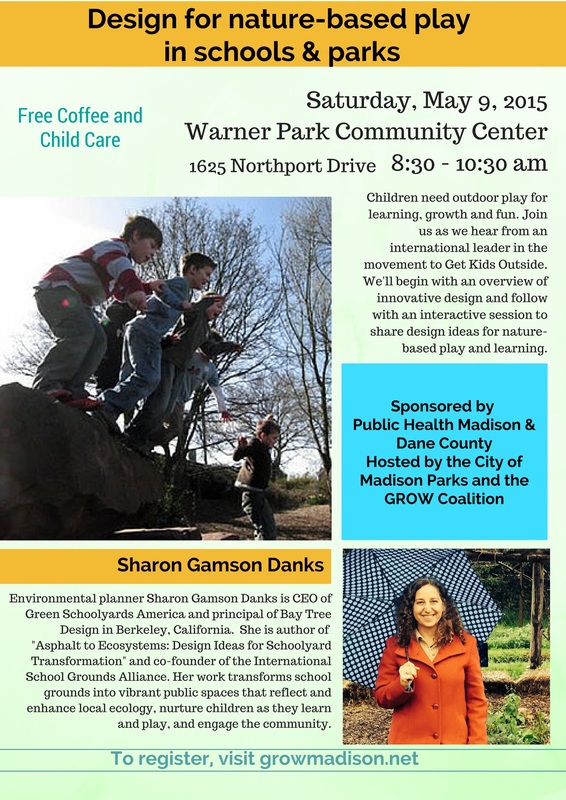 On March 5, a kick-off event at Warner Park Community Center will offer a chance for youth and organizational leaders to review Madison’s assets and current challenges to all children spending time in nature. They will begin to identify common priorities and goals, discuss opportunities, clarify obstacles, and prioritize action steps in the plan. Youth and community organizations are encouraged to register for the event. Can’t come Saturday, March 5? Answer a brief questionnaire and we’ll be in touch! Register now! Simply send an email to Justin Svingen, jsvingen@publichealthmdc.com with: Your name, your organization (if applicable), whether you need child care, and how many children you’ll bring. Sponsored through a prevention grant from the Wisconsin Department of Health Services. Register now! Simply send an email to Justin Svingen, jsvingen@publichealthmdc.com with: Your name, your organization (if applicable), whether you need child care, and how many children you’ll bring.